Kent's Leading Blocked Drains Company! Based out of offices in Gravesend, Maidstone, Gillingham, Medway, Sheppey and West Malling, we offer homeowners and businesses across the Kent, Surrey, Sussex and London regions the very latest solutions to save you time and money. 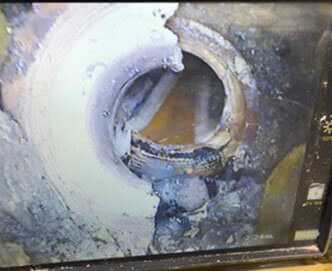 Drain repairs are completed quickly and efficiently using the latest equipment. Established in 2004 as a professional drain repair company, we have continually invested in the latest hi-tech solutions to ensure a fast and effective drain repair solution that saves you time. This means we are able to charge less and provide a fast solution that often does not require digging down to the blocked area. 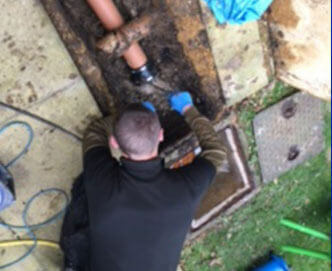 We provide domestic drain repair and commercial drain repair and maintenance services and our staff are highly trained, very approachable and take pride in a highly specialised and focused approach giving us real expertise in every aspect of drains, pipes and sewers. Originally based in Gillingham in Medway and growing over time to cover five sites across Kent and the edge of London, we offer the complete repairs service throughout our area and guarantee emergency call out times within 90 minutes. Kent's leading drainage company employs the best drain repair engineers and plumbers; it’s a team that has worked for decades in commercial, industrial and domestic drainage and plumbing repair projects so they know what they are doing and the best and most efficient way of repairing or unblocking your drain. Working to all health and safety standards and fully insured to £5m for the work we do gives you total peace of mind. Drains are our entire focus so we know what we are doing and how best to apply that knowledge to your problem. As Kent's leading blocked drains company, JLH Drains is accredited for Streetworks and confined spaces with a CSCS card carrying team, ensuring all our clients get the best possible quality of service and we can meet even the most demanding domestic and commercial drainage requirements. 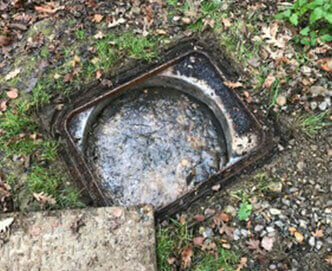 An important part of our drain unblocking work has been adopting new techniques and materials that allow us to carry out repairs with a minimum of disruption and cost; This includes drain lining and CCTV surveys. 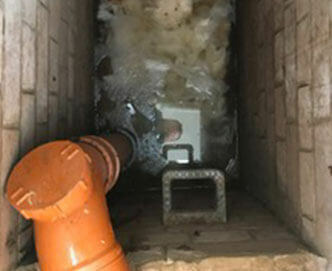 We have also recently added a no-dig drain repairs system that includes placing a brand new pipe within a broken pipe negating the need for expensive and time consuming drain reveal by excavation. We work across London, Sussex, Surrey and Kent with offices in Maidstone, West Malling, Sheerness, Gravesend and Medway bringing emergency blocked drains responses in less than an hour and a half. 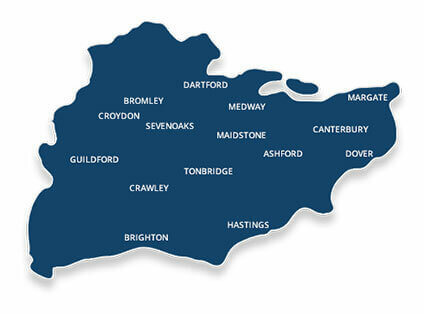 Areas we regularly cover include Gillingham, Chatham, Rochester, Strood, London, Maidstone, Sidcup, Dartford, Gravesend, Higham, Newington, Sittingbourne, Canterbury, West Malling, Orpington, Swanscombe, Wigmore, Parkwood, Woking, Farnham, Guildford, Leatherhead, Sheerness, Northfleet, Sheppey, Cobham, Whitstable, Margate, Herne Bay, Ramsgate, Faversham, Crayford, Medway and London. For further details of our drain care and repair services visit our domestic and commercial drain repair pages of out website. We welcome enquiries at any time and experienced members of our drain unblocking team are always on hand to answer questions and arrange a visit. Based throughout Kent, we will reach you within just 90 minutes if you need your blocked drains repaired urgently. We are available 24/7 and can get to anywhere in Kent, Surrey and Sussex, so rely on us to take care of everything for you! Need a blocked drain repaired urgently? Call our 24hr Telephone Helpline! Alternatively, get in touch with us today for your no obligation quotation as well as a reliable and affordable drainage service.